If there’s one thing that’s making Dior fans go absolutely crazy over, it’s the Dior Oblique print that is now officially back under the spotlight ever since the revival of the iconic Saddle Bag. 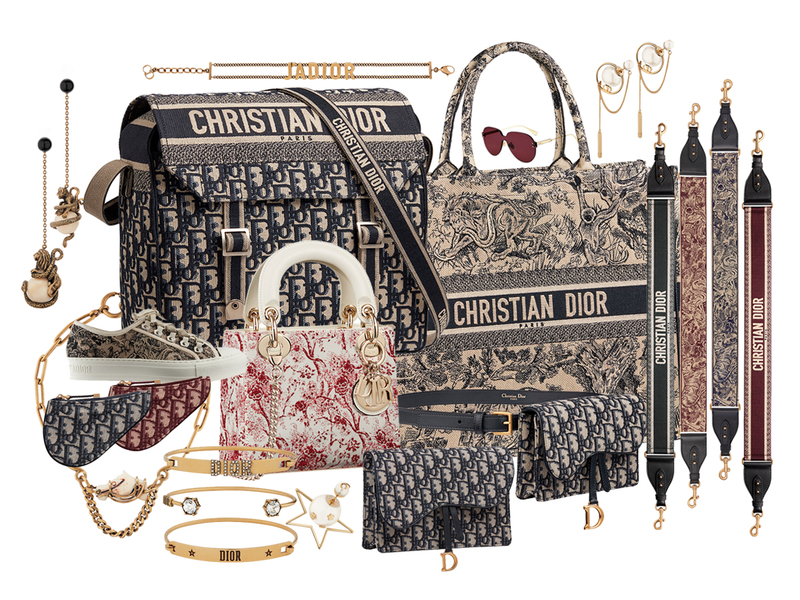 The other key print (which is also the highlight of the Cruise 2019 collection) would be the Toile de Jouy, which Maria Grazia Chiuri has carefully chosen for a select number of luxurious goods that come in colours like Blue, Green and Red. Together, both prints are the stars of some of the key bags and accessories in the curated selection below, which will be shared in detail with prices in SGD just for you. Starting with the Dior Oblique pieces which are sure to fly off the shelves. The Saddle Purse (SGD500) is perfect for all your coins or keys, or go for the Shoulder Strap (SGD1500) which comes in a length of 95 cm that’s great for attaching onto your Saddle Bag. Better yet, get the Messenger Bag (SGD4200), one that works well for either gender. Which also means both of you can always share it as well which makes even more sense. You can also expect to find lovely jewellery pieces like the Diorodeo Earring (SGD560) and Diorodeo Choker (SGD1450), which features a horse and a lion respectively. Both pieces come in aged metal with a gold-tone finish, finished with resin beads for extra visual interest. If you fancy stacking or layering your bracelets, this trio of Dio(r)ever Bracelets (SGD940) will definitely get your attention. Wear all three at a go, or layer a piece on either wrist, the choice is all yours. Fancy something from Toile de Jouy? The Lady Dior (SGD6300) is definitely calling out to you. Pair that with the Walk’n’Dior Sneaker (SGD1450) in a matching print, along with the chic DiorColorQuake1 Sunglasses (SGD620) and you’re literally good to go. If you’re all about a little ‘punk-rock’, consider the asymmetric Dior Tribales Earrings (SGD670) which comes with a giant star on one, and a simple stud on the other. Alternatively, opt for a different pair (SGD710) from the Dior Tribales collection, one that comes in a length of 6 cm that you can casually hang over your ear. Another hot favourite would be the J’adior Bracelet (SGD640), which is adjustable from 16 cm to 19 cm, a good range that will fit just about everyone. On to the gorgeous bags, the Dior Oblique Saddle Belt Pouch is a total steal, coming in at SGD1350. Measuring 17 cm by 10 cm, the pouch comes with a removable belt that can be worn around the waist or carried in your hand like a clutch. Within the interior, you can expect to find a zipped pocket and 2 card slots, making it a pretty solid piece overall. If you’re all about ‘bigger is better’, go for the Large Saddle Wallet on Chain (SGD2800) which comes in at 22 cm by 14.5 cm. Armed with a removable 120 cm chain, this WOC is equipped with a flat pocket for cash, a zipped one for coins and keys, along with 4 card slots. Last but by no means least would be the Dior Book Tote in Toile de Jouy (SGD4200) that’s a stunning piece through and through.